First head to Schwerin by train through the lovely Mecklenburg countryside. In Schwerin pay a visit to the pretty castle and wander around the charming old town. The guide will take you on a guided tour of the inner city and into the palace gardens. You will explore the rooms of the castle on your own (entrance fee included) after an introduction of your guide. A local lunch and drink as well as some time at leisure for shopping or a stroll in the town center will be included as well. Carry on to Rostock in the afternoon by train and explore the old town with the town hall, market square, university, town wall and St. Marien Church with the famous astronomical clock. 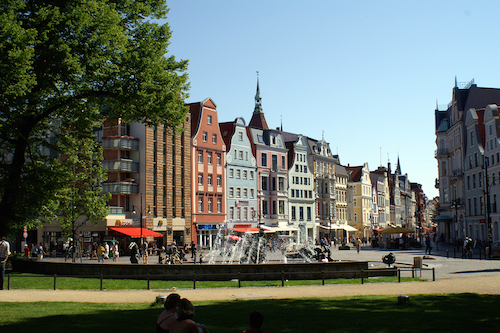 Your guide will show you the highlights of this nearly 800 year old Hanseatic town. Return to Warnemuende by tram and train in the early evening with a basket full of impressions. Time permitting, the guide will offer a brief tour of the fishing village and seaside resort Warnemuende at the beginning or end of the tour as well.